We read (reread) the poems that keep the discourse with ourselves going. We have to break open words or sentences, too, and find what’s uttered in them. I know someone who tattooed double quotes on her shoulder blades. In other words, the body is quotable. To be able to say that one is quotable. A body filled with other’s sayings. 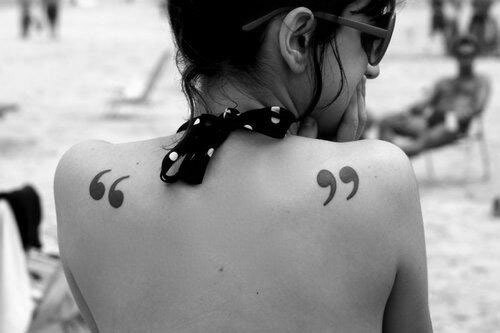 I never asked her what for, what is the double quote tattoo for and why on the shoulder blades? I prefer my own interpretation that keeps shifting every time I see her. What could it mean to occupy that which has been written or said? Someone with double quotes tattooed on both shoulders attempts to reclaim the sign; re-invent it privately-publicly since the body is always split between both spheres. A genre of hide-and-seek; the speaking and silent body which can never mean what it says even while it so desires to mean something. To nest (and hold hostage) someone in double quotes is an act of violence; a gesture of displacement where one is arrested, dislocated, and scrutinized under a distant gaze. I notice the first tooth of the double quote, when paying too close attention, gets caught in the hook of the “f”. I space bar to untangle them; the f does not resist the closed bite of “deaf” and I resist to know what it could mean, because it could doubly mean nothing. A daydream of a mirror-less world while staring through window blinds; a palm tree behind. It was dark with nothing there. A world with no mirrors “in my mind,” though my mind could only reflect what it knew: a palm tree. Naturally then, palm trees multiplied; a world of palm trees reflected the daydream with no mirror in sight.